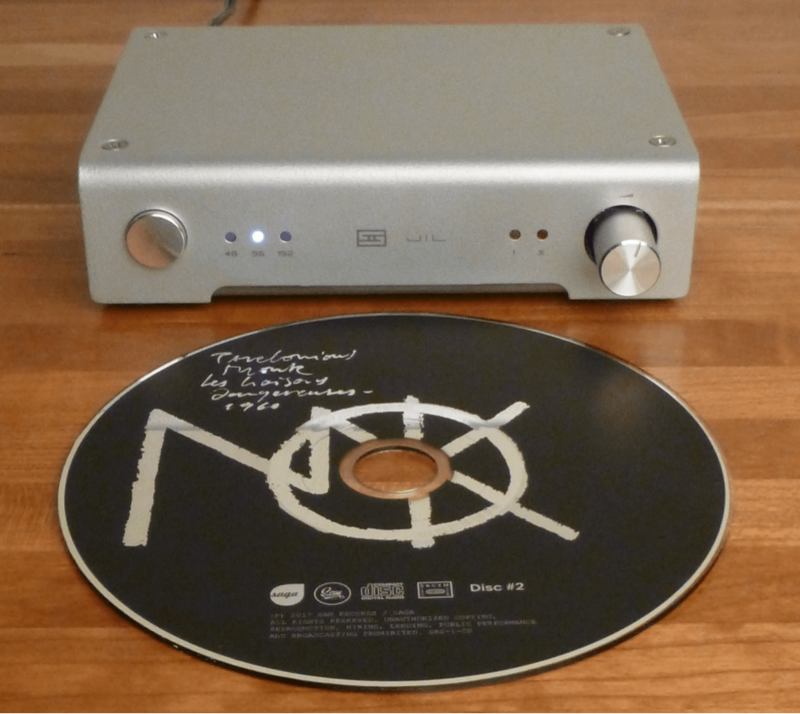 (P)review…Schiit does A to D in a big way: That’s an LP jacket covering the JIL! If you look at my bio page, it’s apparent that I’m not exactly in the first flush of youth. But that doesn’t mean I’m not open to trying something new. As long as I’ve dithered over it for an inordinate amount of time, of course. There are a bunch of 25-year-old analogue tapes (cluttering up a closet) that I want to archive before serious deterioration sets it. I almost jumped at a Parasound phono stage/A-to-D converter a few years ago, but dithered too long and it was discontinued. The Schiit JIL described a few weeks ago on the Digital Audio Review site piqued my interest. It takes a line level analogue signal (the Parasound would do phono and line), and digitizes at 48, 96 or 192KHz, 24 bits (the Parasound would only do 48KHz, 16 bits). Digital output is through a USB jack. If digitizing LPs is desired, connect the output of a phono stage to the JIL. Those that follow Schiit happenings will notice that they’ve expanded beyond their initial line of compact headphone amps, and now offer D-to-A convertors, preamps, power amps and headphone amps in near full-size cabinetry. Compact versions are still available. Actually, I’ve been Schiitin’ you. That’s a CD jacket in the photo above. See below. A CD jacket or jewel case will completely cover the JIL, front level knob and rear jacks included. So, I’m off on a voyage of discovery. I’ll spare you the gruesome details, the minutiae of setting-up and using computers does not interest me in the slightest. There, I’ve betrayed my age again. I may be frugal, but I’m not cheap – so I’ll buy software if/as needed, but not expensive (>$100) software. Then there’s the whole D-to-A side of the equation, getting the digits out of the computer and in to my tube gear. But I’ll deal with the Shiit first. Full review coming soon, watch this space. Easier still, subscribe to be notified of new posts. The Taj Mahal/Keb Mo “album” you see covering the JIL above will, I predict, be getting a lot of play at audio shows this fall and winter. It’s not just the blues you’d expect from these two incredible musicians, but there’s folk, funk, some world beat and rock too. The quality of the recorded sound is very good. New songs and covers (I usually hate covers), they’re all great! I’m a bit of a musical gourmand, so this might not be your thing – but if you don’t like blues even a little, man, you’ve got no soul. Oops something….oh, I won’t go there. At any rate JIL is up and running after a frustrating afternoon futzing about with Audacity. There’s nothing glaringly wrong with it, which is a start. A hint to newbies (like me) don’t even start listening with the D to A in your computer. The one in my new HP distorts on any sample rate higher than 44.1 kHz. As I type this I’m listening to an analogue tape digitized by JIL at 192/24 and decoded by a Meridian Explorer 2. Not shabby at all. If digitizing from LPs, I recommend checking out VinylStudio. It’s pretty good and has a reasonable work flow for managing the recording of the LP and post-processing.